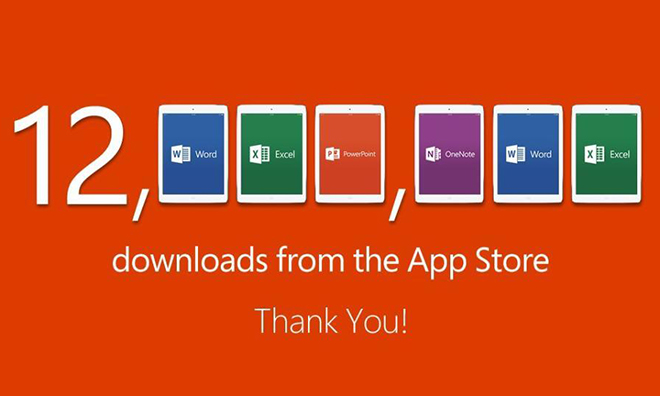 Microsoft’s has introduced Office for iPad last week and it already hits 12 million downloads till now according to a tweet from Microsoft’s dedicated @Office handle. Microsoft Office Suite for iPad includes Word, Excel and PowerPoint as individual downloads for the iPad on March 27, 2014. The apps are free to download but you need to purchase subscription plan to edit any document. Users can buy an Office 365 subscription via the app. If you purchase any subscription plan then it will also gives you access to other Office apps like Access, Outlook and Publisher, along with twenty gigabytes of free OneDrive storage and 60 free minutes of Skype calls per month. The app requires iOS 7.0 or later and you can download it for free from the app store. The company said the software had been “reimagined, while retaining what people love about Office.”, Word, Excel and Powerpoint “have the robust capabilities and familiar look and feel that is unmistakably Office, while offering a fantastic touch experience built from the ground up for iPad,”.